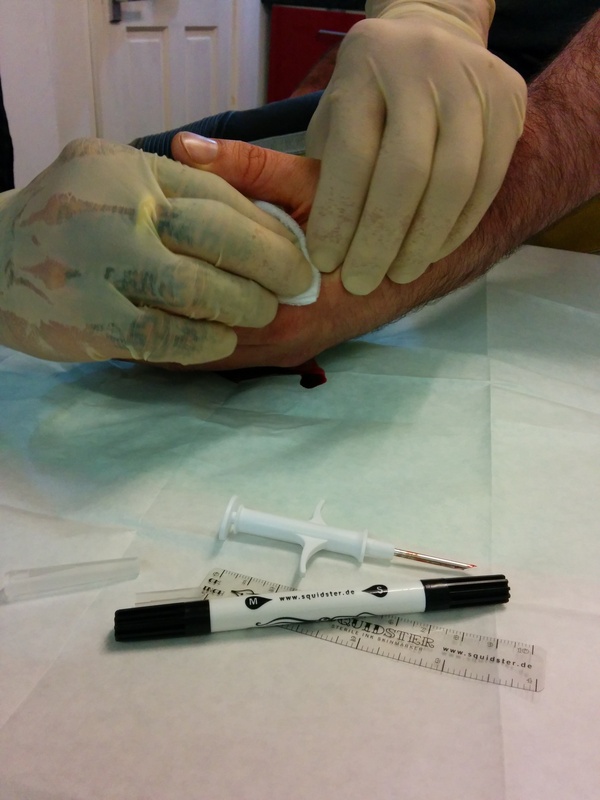 For quite a few years now I’ve wanted to get a RFID implant. The main use for one I suppose is as a key that you can’t lose. RFID readers are readily available and it’s not too hard to add a microcontroller and get it doing what ever you want. The main reason I didn’t get one is that the last few places I’ve worked (and a friend’s holiday house) have used the proprietary Paxton RFID entry system. Whilst this works using a 125kHz carrier like most standard systems, it’s deliberately incompatible with the standard EM4100/EM4200 125kHz tags that are available in implantable form. Very annoying. I did contact Paxton to see if it would be possible ot create an implantable Paxton tag, but unsurprisingly they said it wasn’t. 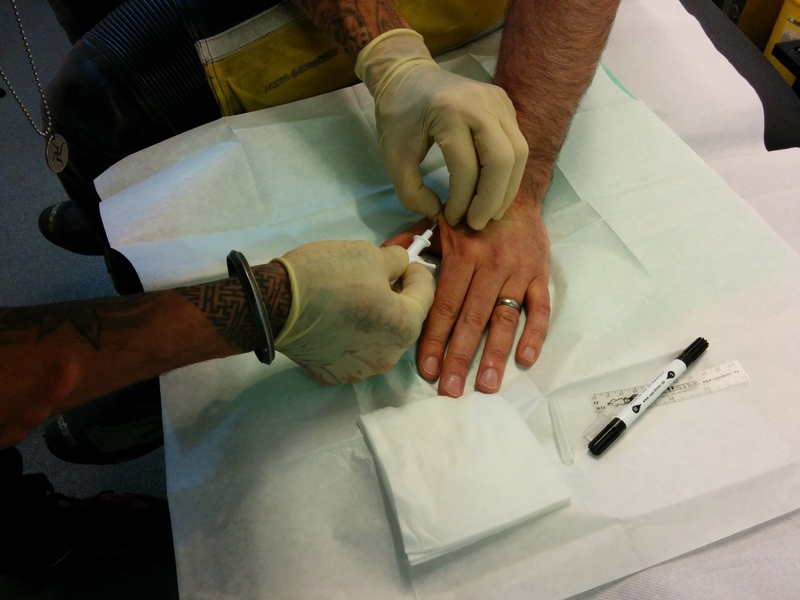 It would be annoying having a RFID implant that I could almost use every day! 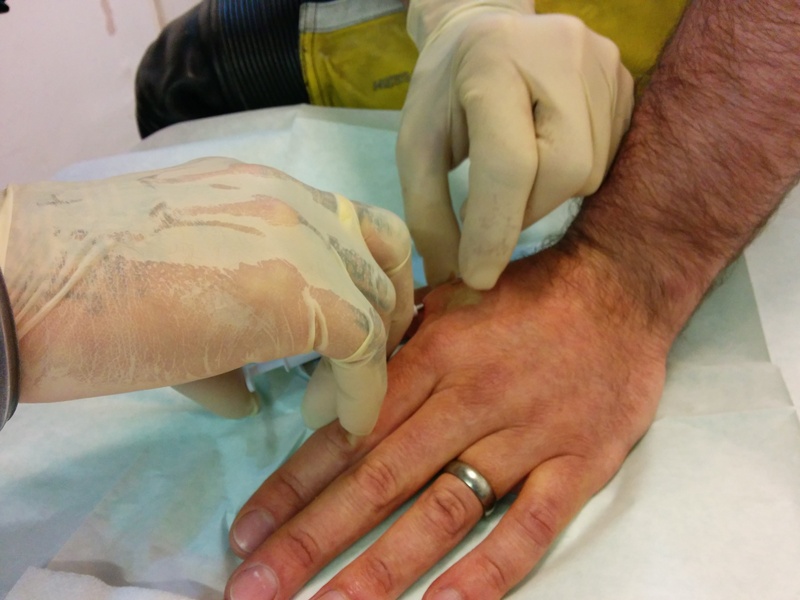 Well, everything changed when I spotted a crowdfunded campaign for a NFC based implantable tag. It was run by someone I recognised from his work with EM4200 tags – Amal Graafstra. NFC is similar, but it works using a high frequency 13.56MHz frequency. It’s pretty much high frequency RFID with a few protocols on top. The big plus is that reading NFC is supported by things like smart phones. I decided to go for it. Here it is. It was a particularly well run campaign. (Much better that the Agent watch I’m still waiting for.) A few months later and my ready to implant tag arrived! 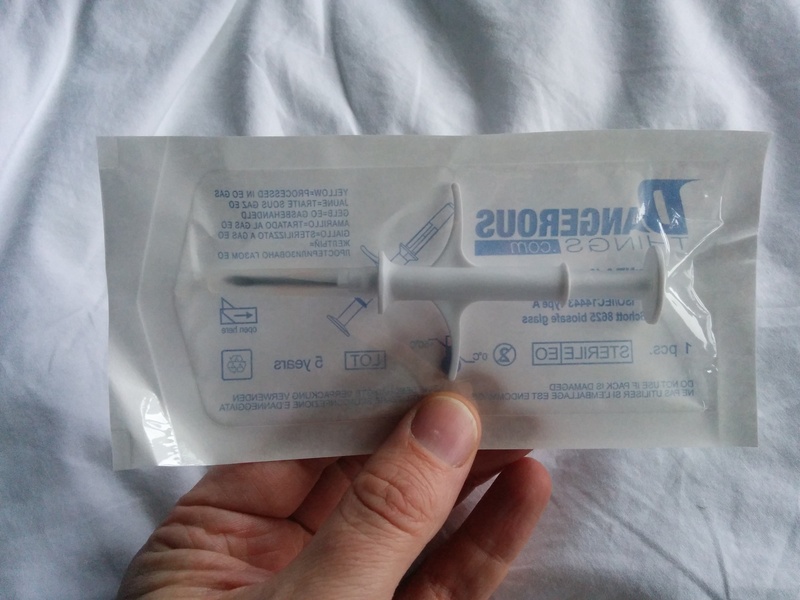 On to the next step – getting it implanted. This proved a little trickier. Some people have done it themselves and I’m not too squeamish about these things, but you really need two hands and as it’s going to be stuck into one of them, you only have one free! My wife’s a GP and would definitely be capable of doing it, but she refused. Not for any medical or ethical reason – just because she said it was “weird, geeky and creepy and if I wanted something daft like that done she wouldn’t help”. Fair enough I suppose. I went to a few piercing / tattoing studios but they all felt it was outside of what they were comfortable with. Eventually Kalima were recommended and I popped along. They were really friendly, helpful and professional. I can’t recommend them highly enough. It wasn’t cheap (£100) but I’d checked out the quality of their other work and was impressed – especially with things like ear reconstruction which must be far more complicated that this! Anyway, with detailed instructions from Dangerous Things and Quentin’s experience with implanting neodymium magnets and stuff, it al went well. Anyway, enough of the waffle. You probably just wanted to see some gory photos! I’m also glad to say it works really well unlocking both my Nexus 5 phone and the Samsung Ezon SHS-2320 lock on my workshop. I’ve currently got my contact vCard on it so can give my details to someone just by touching their (NFC enabled) phone against my hand. That would have been much more useful before I was married!